Olive oil mayonnaise is simply divine. For those of you who love mayonnaise - and I do! - you will already know that no shop brought mayonnaise can compare to homemade mayonnaise. Homemade olive oil mayonnaise is no exception. It has a richer and more intense flavour - its particular intensity being dependent upon the type of olive oil you choose to use, with extra virgin olive oil giving the strongest flavour - a wonderful yellow colour and thicker, more luxuriant texture. It tastes very different to commercial mayonnaise, but try some in a "panini" or with tuna and you will be hooked for life! It is so easy to make and is a much healthier version than commercial varieties (eaten in moderation, of course!). Erico is a sub-aqua fishing friend of ours and prepares this mayonnaise to accompany the small mixed fresh fish - "la paranza" he and my partner catch (if they are lucky!) and fry for lunch. This is his really EASY and delicious recipe using our locally grown and pressed olive oil. Use the olive oil you have to hand and you won't look back! Beat the three egg yolks together with an electric blender, mixer or food processor. You can* make mayonnaise by hand with a whisk, but be aware that it will take some beating. TIP: place a damp cloth under the bowl to help keep it in firmly in place whilst you work. With the blender still running, slowly add the olive oil to the beaten eggs one drop at a time, keeping the blender running in-between each addition. Make sure that each drop of olive oil is fully incorporated before adding the next. NOTE: This first part of blending in the olive oil is the most important: you are looking for the eggs and oil to form an emulsion together. Check the mixture after a few additions of oil and if it the eggs and oil appear to have combined well - i.e there is no sign of oil sitting around the sides of the bowl or in globules on the surface - continue to add the remaining oil, but this time in a slow trickle. Blend in part or all of the lemon juice, depending on your preferred consistency and how sharp sharp you prefer your mayonnaise to taste. Season with the salt and pepper to your taste. NOTE: Each olive oil has its own particular flavour and some have a more peppery flavour than others, so you may want to taste it each time before seasoning. * The day I made this olive oil mayonnaise was the very first time I had made homemade mayonnaise and my food processor and then hand-held electric mixer both broke-down on me! So, after transferring the initial egg and olive oil mixture into a third bowl, I made the mayonniase by hand with a whisk. So I know that it can be done! The upside is that I am sure I earnt sufficient calories credit whisking to warrant the mayonnaise I subsequently ate with our cold meat for lunch! 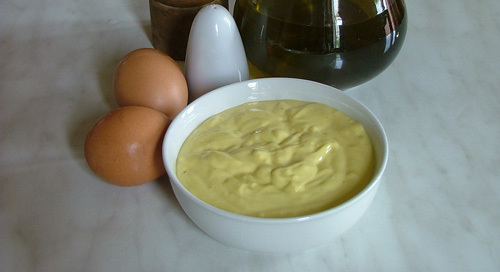 As this homemade mayonnaise recipe is made with fresh eggs, it should be stored in the refrigerator and consumed within two to three days. To share this recipe with friends and family, click on the button for your favourite social network in the scroll bar to your left. For more recipes from Italy - from undiscovered Tuscany and Lazio - click on the link in the "Explore some more..." box below. It will take you to my Maremma Guide collection of authentic Italian food recipes from antipasti to Italian biscotti recipes to Claudia's chocolate tiramisu and many more. Each one kindly given to me by an Italian friend, relation or local restaurant owner and well and truly tested and enjoyed!